Zoe, Linsday and I just returned from a sweet P10 ski! Lots more snow than yesterday but the pavement is not frozen so it's better to stay on the shoulders. Vauhti yellow was great for grip!! As John Langstone said this morning, 'It's good to see an old fashione snow storm!' Also good to see was the grooming! Demsis had the big machine out this morning putting in both classic and skate tracks. It started at P10 and went to Champlian when I skied, but may now cover the entire loop. Those who ski this afternoon can report. Skating was soft, but the skis didn't go through to pavement which is nicely covered by frozen slush from earlier in the week. Classic tracks looked nice for the most part, with a few spot showing grass. It was rock skis this morning, but maybe good skis by the end since there was considerable accumulation. See photos. The snow is fabulous! I started at P8 at 5:15 pm and (skate) skied up past P10. The parkway hadn't been groomed again, but the skiing was still magnificent! There's definitely no need for rock skis, although rollerski poles would probably have been better than regular poles. Yay for great snow!! Freshly groomed tracks this morning! It is hardening up a little more and both classic and skating are great! It looked like they were starting to pack Ridge Road as well. Skiing was excellent this morning. I hope you got out...Mon/Tues aren't looking so good. Skating was fast and free, classic was tricky to get good wax. You needed to wax warmer than expected since the tracks were glazed, but then you couldn't step out of the tracks. There wasn't much melting yet, lets hope the sun holds off. Here's a picture of that elusive creature, the Park Photograper. Jo-Ann Holden (of "Musician on skis.ca" fame) may have had the park to herself this morning to photograph as she does daily throughout the season. She reports that the skiing was great early this morning with very little snow lost at that point. See photo at Mica. Let us know what its like if you ski later today. About 5cm of heavy wet snow fell overnight, and more was arriving this morning. We skied from P10 and it was slow but good. Skiing was not too bad, but not fast or groomed. They won't (hopefully) groom today with the temperature set to drop. Skiing should be great tomorrow afternoon, slow today. The beautifully groomed parkway made for a fantastic loop this morning! I started at P10 at 9:15 and finished at 11:15. The snow was fast and the trails were still in perfect corduroy form (the classic tracks looked immaculate - on par with Canmore)! The loop was almost flawless except for the trails between P8 and P10 where it was icy and the pavement was coming through. Great skiing!!! I started at P8 and it was quite icy in places and rough. I was doing classic skiing. 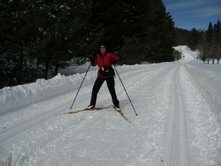 There was some new snow on the side of the road and someone had skied a classic track, so I went there. I crossed the road to the Fortune Pkwy and the linking trail had a lot of debris and some little gravel pieces so I walked around some of it. It seemed to be ripped up from grooming equipment. Up from P10 it was like a totally different place. More snow had fallen and not melted. There was about 5 cm of fresh powder snow on the ground, well groomed, decent track set and the trees were beautiful with about an inch of snow covering the branches. I went as far as Shilly Shally but trail 1 was decent to there and as far up as I could see. There were a few rocks poking out so one had to look carefully. A few cm of fresh heavy snow this morning, but by the time I finished the falling snow had turned to fog as the air warmed. Skating was fast with the fresh snow over yesterday's grooming. Classic tracks were solid and recently repacked. The base we have should weather today's warm-up. Skiing down near P8, P5 or Gamelin might get thin but from P10 up top should still be great. Skiing this morning was beautiful and crisp. The parkways were very well groomed, firm and fast. I skied Ridge Road from Penguin to Champlain to 1B on my rock skis. It's been rolled by machines earlier in the week but only human groomed lately, so it's narrow and bumpy, not recommended for the less adventurous. I didn't hit any rocks, or even see any. It was nice to get onto "real" trails and out of that cold wind! Tomorrow should be great skiing. Lots of snow! It was just groomed at 7am, so it was still a bit soft when we skied but it was nice to see snow banks along the parkways. Ridge was machine groomed, but looked narrow and needed some more grooming. Should all be well packed and firm by tomorrow. Get out and enjoy! I gave my ski conditions report from the top of Penguin this morning to Kathleen Petty of CBC Radio's Ottawa Morning show. The groomers were out at 7am doing the center of the parkways for skating. There was just a dusting of new snow, but it will help firm things up. Ridge Road was well groomed for classic and skate, but still a bit soft for your poles on the outside. It was maybe a bit narrow too, but maybe I'm not used to seeing snow banks. It was definitely better than most of last season! Burma was still ungroomed, but skied in. Hopefully they get to it soon. Enjoy the skiing, it should be great everywhere in the park! There hasn't been any grooming since yesterday morning so the classic tracks are starting to get messy where they turn or simply disappear where they were shallow. Everything was nice and firm execpt for the poling in the outer classic lane. The skating was skied in but still very nice as there is some loose snow on top. I skied burma yesterday and beside 4 patches of little pebbles it was really nice. Soft and narrow but perfect for practicing that balance and having a fun ski. Bottom line is for early December the conditions rock and the weather is perfect. Stop whatever you're doing and get out there. There was a dusting of new snow this morning. The groomers were out and it looks like most of the park was re-groomed last night. Parkways are really wide and firm. Ridge was getting firmer in the middle but is still groomed a bit narrow, but the groomer may still have needed to circle back as one set of classic tracks was a few days old. Ridge to the Firetower was still ungroomed as of Thursday, as was Burma. I skied to Huron, then out onto the parkway and forgot to check Burma this morning. Hopefully it will be ready by the weekend. Camp Fortune race trails were groomed, but very soft, too narrow for skating and not trackset. It's a start. A few of us with some Carleton skiers skied out from P10, took Burma and Ridge road, went down #2, up #40 and #33. We then backtracked to P10. Everything was nicely groomed. Burma still needs a little work in the classic tracks but #2, #40, #33 and ridge road were a close to perfect as I can imagine this early in the season. There was little congestion on the trails due to sub -10C temperature I guess. It made a for a good semi-epic ski with easy kick, ok glide and plenty of room on fun downhills. The conditions on the Fortune Parkway are great for classic, but getting a bit hard and rutted for skating. Ridge Road between Keogan and the top of Penguin was in a similar state. There was 10-15cm of new fluffy snow. Wayne broke trail until the groomers went by around 7am, so it was very soft and will likely stay that way until tomorrow. 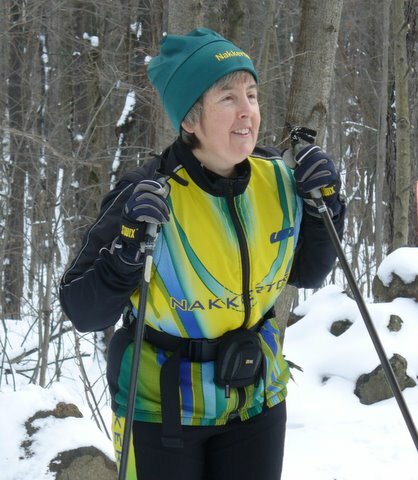 I skied from P2 up trail #5 as well as the Champlain parkway and around the field at the start of the Keski. Everything was groomed nicely with no ridge down the middle of the parkway this time. The grooming was sub par this morning. Now I understand the complaints I've heard. The ridge on Ridge and the hide-and-go seek tracks are an issue. Read my thoughts here. You might also want to send your comments to the NCC (info@ncc-ccn.ca) and Demsis (info@demsis.ca). Wow, what a great storm! I wasn't the only crazy out there today, there were lots of skiers out enjoying the blowing, drifting, blinding snow. It was quite a fun slog through those deep drifts. The good news is that the groomers were out already packing down some of that snow. I don't expect it to be firm until about Tuesday. We've got enough snow to last us until May now! The skiing was pretty nice today. I was suprised at how well packed the trails were given the huge amounts of new snow! I opted to skate but regretted my decision somewhat as the skating was quite slow and my classic skiing companions made it look so easy! The parkways were in great shape this morning. Penguin and Ridge were half groomed - only one pass of the machine wide leaving one good track and one partial track making 2-way traffic difficult. I guess that's what we can expect during the week now; good parkways and so-so trails. I miss the Lafleur days of good skiing. We'll see what the weekend is like. Nice skiing today! I was skating on a limited section of parkway, but the relatively soft tracks and good glide made for easy conditions to ski in. Saturday morning looks like the best bet for weekend skiing, but Sunday might not be too bad if you don't mind the rain (at least it will be warm)! My father and I skied in the rain today. The tracks were in great shape even as we finished around 1pm. All the rain that had fallen to that point was being absorbed by the dry snow. This should firm the conditions up as the temperature is set to drop near midnight. Hard to say if they will be able to groom tonight or have to wait until tomorrow but at some point the groomers will get their first test at renovating the icy tracks with their new machines. If all goes well it should setup firm and fast but not icy. Let us know what its like in the area you ski tomorrow. I started around 10:15 and Demsis was grooming as I skied. The conditions are a little soft right now and plenty fast. It will harden up throughout the day as its nice and cold. Great for skate or classic. Only the parkways seem to be groomed now and it might take a while to get the interesting trails done. There is no noticeable harm to the parkways from yesterday. Beautiful skiing conditions. The parkways, Ridge and Burma are all well groomed. It's fast conditions but not too hard or icy. The fresh snow from last week absorbed the water and the groomers did a good job converting the packed area that turned icy back to powder. There was also ~5cm of new snow yesterday that mixed with the old to make it just about perfect. Merry Christmas! No regrooming on the parkways but they are still in great shape and the conditions are fast. Get out there and enjoy the mild weather! The snow has begun again! The trails are getting covered and the tracks are filling in fairly fast with some wet, fairly heavy snow. What worked earlier in the day is starting to drag, so it's probably a good idea to change to something a bit less sticky, like the purple. Everything's still in very nice shape! Beautifully groomed and great skiing! Conditions were fast and free and all that fresh snow packed fairly well. The only tricky part was getting a classic wax to work - eventually we settled on Tar Zero covered with Aluminum or just Aluminum by itself. Enjoy before the snow/rain/sleet/snow/rain tomorrow. Should be interesting. It was spring skiing in December! With the nice warm temperatures I skied this afternoon. It looks like there was a decent snowfall last night, maybe up to 10cm and they groomed that in the morning. It was all well skied in and getting slick for skating when I was out. Classic looked beautiful if you packed your klister. It should all get tilled up tonight and fresh and fast tomorrow. If your doing classic bring teho green, purples, reds and klisters just to be safe! Another beautiful afternoon ski! I did a loop from P2 up #5, 15, 7, Gatineau Parkay to #29, 26, 5 and back. Classic tracks were in great shape, but the snow was variable from glazed to more powdery. I tested a few wax combinations (read my first attempts failed!) and then hit on the Silver Minus klister. Definitely the wax of the day. Excellent grip and glide, it didn't pick up leaves or ice up. Every trail I saw was in great shape and the tillers had broken up the firm glazed skating lane into a smooth and soft surface. The Park received about 5cm overnight and they had groomed this morning. There was also so re-grooming on the parkways around 1pm. The parkways and Ridge Road were in great shape today. The groomers hadn't been out to the firetower yet today, but people report is was very skiable. The snow was fairly greasy and fast for skating on Ridge. The parkways were either fast or slow depending on the location. Grooming was done yesterday, conditions are very good, pretty well packed and fast for the temperature. 5-10cm of new snow, but no grooming. A Friday trend? Skiing was good despite it though. The new fluffy snow may be the last for a little while so you should get out and enjoy as much skiing as possible this weekend! Conditions this morning were great! But by 9am you could already feel it warming up and I imagine the wax will have changed. Tomorrow will probably still be great skiing in the morning, but by afternoon it might be getting messy. Enjoy the skiing this weekend, because with the warm weather coming it might be awhile until we see mid-winter skiing like this again! Heat Wave Day #1. It was really foggy out there, but at least the Sun wasn't out to melt the snow. It was nice spring skiing conditions for skating in most parts of the park, a little slow in some spots though. The classic tracks looked slick and icy, but you would get good grip with the right klister or good waxless skis. The parkways had been re-groomed last night and were very firm but rather slow. The secondary trail - Ridge Road to the Firetower, Burma and Fortune race trails were all well skied in but still in great shape. It will be interesting to see how our snow holds up over the next few days. We'll keep you posted. Heat Wave, Day #2: The skiing was great this morning! There has been some loss of snow since yesterday, but we're still in good shape with plenty of base. The skating lane was wet but still fast enough and you could easily get an edge for nice drag free skating. The classic tracks were still solid; wet new snow going to corn but not icy. With a little red klister you can get rollerskiing like grip and still have great glide. The water is draining well and the snow is still relatively clean but there are twigs and leaves in some spots. I would recommend getting out today before it rains. Heat Wave, Day #4: I was too wimpy to ski in the rain yesterday, but have a look at www.musicianonskis.ca for a great report and some beautiful fog pictures! Skiing this morning was great. There was a thin crust over a softer base and skating was fast and easy. Classic would have been fast but you need red/silver or some such sticky klister. There was lots of debris on #5 and #15, but not much on the parkways were it was blowing a gale. The wind was strong enough to stop me in my tracks once or twice! The sun was just peeping out at 9am, and it was starting to soften. Should be great spring skiing all day. Icy and fast today. Well rutted thanks to apparently not being groomed anytime in the recent past but definetly fun skiing if you are up for the balance challenge! The snow is in decent shape but you might not want to use your very favourite skis. Trails were groomed (parkways and other trails) sometime yesterday evening, before the snow. When I skiied classic early this morning there were a couple of cm of fresh snow over top. Both classic and skating were very good, but grip waxing could get tricky. Tomorrow should be perfect skiing. The skating is good and fast, but you can still get a good edge. Parkways are in good shape, and trails (Ridge) not bad considering the rain we had. Conditions seemed to get better heading out towards the fire tower (1 A/B and beyond). You'll need some aggressive grip (blue klister?) if you're planning on doing classic. Be careful skiing Burma! There are a few dangerous spots, so keep your eyes open. Same on Ridge, watch for potholes and a big ditch with a steep drop off at the edge of the trail. Generally if its groomed its great and the parkways are fast and smooth. Ridge road was groomed and fast from Keogean to McKinstry but not up to the fire tower. The parkway between Huron lookout and Champlain was also ungroomed and in bad shape as there was only a thin sheet of ice covering the sometimes bare asphalt. Everything else was in reasonable condition. Go skating if you don't want to mess with klister. Didn't get out this morning, but a few of you asked and I found that this picture shows what it was like - musicianonskis.ca. Just watch out for the potholes and ditches if you ski Ridge, Burma etc.. That new fluff will hide them well! Everything in the South end of the park was groomed and in good shape. The parkways had deeper soft snow, which was a bit slow, but #5 and #29 were fast. The old corn and sugar snow from the thaw freeze was mixed in to create a faster surface on the secondary trails, whereas the parways probably had more snow accumulate due to drifting so they are more powdery. So, it's slower than the weekend but much nicer looking and you won't need klister! The groomers were out this morning around 10:30. Everything I skied was in good to very good shape. Conditions were hard underneath with some soft powder on top. Tracks looked to be in good shape. Burma is good, but keep your eyes open for the odd place where there are bumps, ice, or thin snow. Great day for skiing! Parkway was windswept and didn't seem to have been groomed. The skiing was a bit slow with the fresh snow on top and tracks were non existent in some sections. Carrot did work well for grip though which I was pleasantly suprised with! Looks like it should be a nice weekend! Conditons this morning were excellent, with powder on top of a fast and icy base. Everything skied was in excellent condition. It would be a good idea to have binder on for classic skiing, as the tracks are fairly abraisive. Grooming had just started on the parkways by 9am. There was 5-10cm of snow by then, but it's fluffy and fast. Trail #5 was in good shape from the weekends races but covered in snow. #15 hasn't been repaired from the melt so the fluffy snow hides some ice and narrow spots they should fix for the sake of the Gatineau Loppet. This new snow will help. I'm sure there will be another update later today. The snow is deep, making the parkways very slow for skating. Although groomed, but snow didn't compact at all. Penguin/Ridge Road was also groomed and much faster for skating. The classic looked great and would be the best option for today! Did P7 to Penguin - took the #1 (Ridge road) to western and back. Conditions were excellent for classic as the grooming looked recent. One of the best ski days of the year in my opinion. Used regular blue wax with a toko base wax. Worked fine. Today the conditions were awesome. There was a nice hard packed track for skating and classic and it was really easy to get perfect grip. DEfinetly a good day to hit up the trails! Tomorrow should be stellar too. Everything in good shape today. Looks like it was groomed last night creating a fairly hard surface, and then a dusting of powder came down today. It is a little on the slow side for skating, so you might want to classic. Burma is in good shape and is starting to be groomed wider. There is one spot near the swamp about 1.5 K from the top that is thin, so keep your eyes open for it. Weekend skiing should be great. Enjoy. Conditions were ok as I hit some blizzard conditions followed by ice pellets. I also forgot my wax ski's so I used my waxless and it seemed fast enough. About a cm of fresh snow and ice pellets on classic trails but didn't seem to really hold me back. If it warms up, I would imagine the classic tracks will get fast. Great ski conditions this morning. From Gamelin it was freshly groomed, and crushed ice mixed into the snow made for fast conditions, but you could still get a good edge skating. The classic tracks looked solid and abbrasive, so you'll need a good binder to keep your wax on. It's started! Yet anoter BIG storm is upon us. Skiing before 10am was fast but expect it to start getting soft and slow soon. Send us a report if you ski in the park and we'll share. We're all at Nakkertok for the Eastern Canadian Championships this weekend! Come out and see Canada's and the World's fastest sprinters this weekend. Fresh snow, beautiful sunshine and great trails... what more can I say? The trail from O'Brien parking lot hadn't been freshly groomed, but the skiing was still really nice with the fresh snow on top. Skiing was great tonight, the grooming was holding up and the conditions were fast and fun! Nothing was groomed with the rain expected later today, but the skiing was great. 5cm of new snow covered with a thin crust made for nice skating. Classic would be a bit tougher as you would be breaking through to drier snow, but violet should do the trick. Getting it to last might be an issue. You had to be tough to be out there in the mist this morning. I'll say that as I was one of 3 people and one of the others was the legendary Vic Emery, training for that little Norwegian race this weekend, Holmenkollen, to be followed by his real goal the Birkebeinerrennet. Good luck Vic! Beautiful day for a ski. With all the moisture from yesterday mixed with the fresh snow that was waiting to be groomed the result are: perfect grooming and fast but not icy conditions! The Park was looking very professional today. Burma was in immaculate shape and well worth the drive today. Parkways were double wide for skating and it should make skiing great for the Winterlude travelers. If you had to be tough yesterday, you needed to be tougher today; tougher to stop yourself from skiing all day that is. All this new snow should make for great conditions for the CSM this weekend. (Still time to register!) I've been asked to post a wax guess for CSM skiers, so I will have one ready mid-day Friday. Skied from p10 to Burma and back in what looked like 15cm of very fluffy snow. Snow drifts appeared on the later part of Burma closer to the #1. We essentially cut trail the whole way and it was a blast. On our way back down Fortune Pkwy to P10, the groomers were just starting. As of 10am, there were no classic tracks but skaters had a freshly groomed track. Very nice skiing today, with some a couple centimetres of fluff over what might be described as a firm base with a bit of icy now in it. Both classic and skating looked good on all the parkways and ridge road. It's been quite a while since I have seen so much snow in the park. Enjoy it! Very nice skiing in most places this morning. Nice to have the slightly warm weather as well. Strange that Burma had not been groomed since last night. The race course was not groomed either. A bit chilly out there this morning, but no real wind if you stay off the parkways. They've started setting up and grooming for the Gatineau Loppet. They widened #5 a bit, and groomed the walking trail part too. Hopefully they did Ridge and Burma too, they were far too narrow on the weekend. The stadium is groomed, looks like less snaking through the open field and more following the bush line out of the wind - yeah! I skied, #5 and #26 and parts of the parkway too. It's hard and fast but not icy - perfect for racing. A bit of snow coming overnight so it looks like we're all set with perfect conditions. No excuses not to sign-up now! It must have been "Groom-Your-Own-Trail-Day" in the Park today. Maybe it's a new Winterlude event I don't know about? Not very impressive for Gatineau Loppet skiers trying to do there final preparations. There is about 10-15cm of heavy new snow and no grooming to be seen by 9:30am, not even the distant rumble of the machines. It was very difficult skating conditions, ok classic if someone had skied in a track for you. A classic skier even stopped us to ask if it was ok that she ski on our skating tracks - I've never had that happen before! Awesome skating this afternoon. I was realy happy with how well the snow had been packed into nice tracks! Reasonably fast too, given the recent cold snap. Everything I saw was groomed although Burma did not have a track for classic. The grooming is good, just a little soft for skating if you're a big guy but not too much and really slow. Grip and balance were easy with perfect weather. Might be wise to go for green covered carrot later in the day. We did the 15 from the gatineau parkway to Mackenzie King and took the 7 back. Wonderful and quiet with snow banks on the side of trails. This winter is nothing short of extra-ordinary. Soft conditions are what is waiting for you out there right now. Ridge Road was in the process of being groomed while I was skiing at around noon with one pass having been completed on most of it. The parkways were goomed, but also quite soft. I would expect things to harden up over night fairly nicely, but I don't expect it to be terribly fast for any of the weekend racing. If you stayed inside afraid of the cold you can go out now, it's a beautiful day for skiing! Hope everyone enjoyed the Gatineau Loppet, The tracks had setup nicely overnight and the grooming looked great on the parkways at least. With almost no wind it was pleasant enough at start time, even though it was -20C or less. Felt a lot warmer by noon. I went for a short ski around 11:30 today. Nothing had been groomed recently. 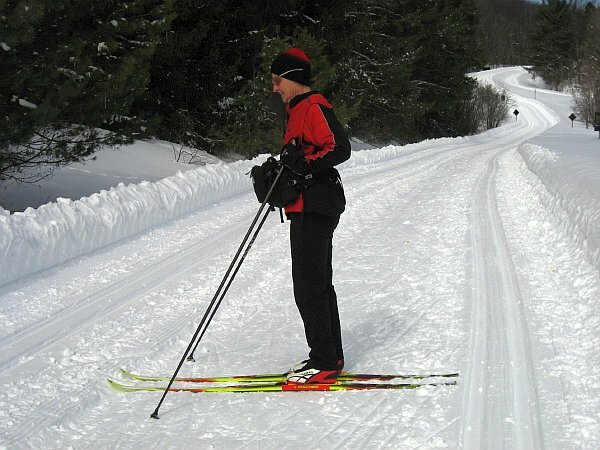 While P8-P9 was quite skiable, most people would not enjoy skiing on the other side of Meech Lake road in the direction of Penguin. Classic skiing looked tricky, with significant ice forming in the tracks and no grooming having been done. Hmm... no one I know of has skied today. I imagine icy, watery, slushy, crusty nastiness. Comparable to skating on the canal last week. If you have first hand info pass it along. Also feel free to share your Gatineau Loppet stories or comments. With all the rain last night you would think that the trails would be a mess. But not so. The classic tracks on Fortune parkway are glazed and may have been groomed last night. Demsis has run skidoos up and down Fortune (also Burma and Ridge road) to break up the crust leaving fast granular wet snow for the skaters. Conditions were really quite good on ridge road out to Champlain Lookout. It seems the trees stopped the rain just enough to prevent glazing of the tracks. Snow was soft and not loaded with water. Skaters were smiling. My grip wax was Swix red klister covered by Rode silver, worked like a charm. Expect to need a violet klister covered by a hard wax tomorrow. Wow, I wasn't expecting a blizzard this morning! There was a lot of new fluffy dry snow in the park this morning, 15cm at least and some drifting for good measure. The soft race skis I had waxed were quite fast which made what could have been a tough slog the easy ski I had planned - even if I couldn't see my skis for most of it. Around 8:15am I found a groomer and followed his path. He had come up the parkway and then made a loop on #5 and around the stadium at Skinouk. All that fluff compacted well, and covered the icy base nicely. I'm sure by midday this snow and grooming will be finished and conditions will be great everywhere. Beautiful day for a ski! Classic skiing was great and Ridge Road was freshly groomed at 7:30 this morning. I also skied Skyline and it was fairly well skied in but still nice and powdery. The parkway had one pass down the middle for skating and the classic tracks were set yesterday so were still in pretty good shape, just had a bit of snow accumulated in them. Get out and enjoy the sun! No new grooming done this morning. The classic tracks are nice and hard, they have held up well for the past couple of days. The skating was hard and fast. I started from P5 up penguin and ridge road then took the parway and came down black. I then took trail 15 from Mackenzie King to the Gatineau Parkway and back to P5. I purposely waited until it had snowed as the trails were previously really hard for skating. It was a little slow but the little layer of fluff was great to have for balance. If they groom tonight it will be great for skate and classic tomorrow morning. Firm, not soft not cement and nice weather. The conditions were perfect this morning. The sun is out, the snow is firm but not hard and temperature is perfect. If you haven't gone out yet replace reg carrot and green with fluor carrot. Replace green glide wax for blue as it should warmup quite a bit in the next few hours. Try the small trails, they are in really good shape and lead to a magical skiing experience. The snow had started to accumulate on the trails this morning, making the skiing a bit slow. No grooming was done today, hopefully they will have it done for tomorrow morning after today's snow! Nice day today! Some parts of the tracks had some snow blown in them but overall it was a sweet hardpacked ski day! Cold and Clear, so nice! For those of you familiar with Canmore, on the parkways, we have "Canmore conditions". This means rock hard and a bit icy. Ridge road is not quite as hard or as smooth, but in reasonable shape. Despite being kind of cold, it was a GREAT day to be skiing! Lots of fresh snow this morning! We were at Nakkertok...they had cookies. Tomorrow though, is a great day to ski in the part - its Norway Day! Norway Day is a great family outing. Traditional Norwegian specialities, such as vaffels and warm solbærtoddy (blackcurrant drink), are served for all to enjoy. Also, kids can participate in various winter activities. This popular one-day event takes place at the Huron Shelter in the Park on Sunday, March 2, 2008 from 11am-2pm. More Details. One of the most beautiful skiing days of the winter. Warm sunshine, perfect snow, decent grooming, and Norwegian vaffles! Too bad it won't last, but the skiing should weather the storm just fine. It was not rock hard glare ice in the park as one might expect today, but rather just a bit crusty but still quite skiable. The kind of crust that one of those big heavy duty grooming machines that Demsis owns could easily break up should they decide to drive it around the parkways for a little while. Maybe they will skip today and wait for the 20cm coming tomorrow. Even without the grooming, skiing is very possible. Watchout for the divets and rut on the downhills. Sections that usually get heavily snowploughed on the weekend are icy - Burma, Penguin, #40, etc.. Careful. Lots of new snow again! I was pleasantly surprised this morning to see that the parkways and ridge road had been groomed by 8am. One pass on each has been done. Snow is accumulating on top but the grooming has firmed it up nicely and the skiing is great. Enjoy! You'll have to forgive us, we don't know what the park is like. We skied at Nakkertok this morning since we knew what the grooming there would be like (i.e. very good!). It was generally hard packed with section that had drifted tending to break up and become soft with repeated abuse during intervals. I imagine the park would be much the same... but you can let info@xcottawa.ca know and we'll post reports here. I started the ski from P3 and it was not that great with a loose styrofoam powder or semi skied in tracks and it was like this all the way up 5 until I got to 29 which was groomed. I did a bunch of intervals on 29 from the stadium to the Parkway (reverse Keski finish direction 5:30-6 min each) as this section with groomed and by the time I was heading back the groomer had done 5 down to Gamelin. You can count of all the lower trails in the parks being groomed today. The Parkway groomer had not as yet come by, but I would imagine that it will as I have never seen the trails done and the parkways not done on the same day. As good conditions and grooming as I've seen all season. 5 was ungroomed on the way out and the skied classic track was a bit slow, but from the Relais connection they had all been groomed long enough before that the classic track was solid underfoot. The skating track still seemed a bit soft for strong pushes, but the corduroy was hard enough to catch edges on downhills here and there. The Parkway was freshly groomed, one side only and quite soft there, but should be well hardened up by now. Generally well groomed,firm packed and good, but some places are still soft and other getting crusty. That's all going to change soon as the snow starts to fall. We'll be out early tomorrow morning and report back. Wow, the latest storm updates predict 30-50cm! Winter Wonderland! Driving through Gatineau on the 5 was fine this morning until Haute Plaine, but still safe. There were 20cm of new snow but P5 had been ploughed. Demsis had made one pass along the Gatineau Parkway grooming a skating lane and 2 classic tracks along the right side which was great. Ridge Road up Penguin was also groomed. It was soft, but that was expected. The snow held off until 11:30, so we skied in the gap between the jab and knockout blow. Should be interesting tomorrow! Skied this morning from P12 up to Ridge and out to Huron as well as a few backcountry trails here and there along the way. Only 4 or 5 cars in each of the lots along the Meech Lake road (folks still shoveling I guess). The main trails (40, 2, 1 (but not 1B? ), 3 and the parkways) were groomed but the conditions were pretty soft. No surprise with a half meter of fresh snow. The Parkway was solid though as they must have been grooming it repeatedly over the last couple of days. I suspect another pass of the groomer and these cold nights will help to solidify things. Photos. Demsis has done an excellent job of grooming the >50cm we received during this weekend's March Madness. The snow banks are huge in places - Burma truly is a bobsled run! Everything I saw was packed and trackset, including #1 out towards the Firetower. (The groomer was just coming back at 11am.) It wasn't fast this morning, but the Sun was starting to improve that as I was finishing. Some parts are still soft, but the warm March days and cold nights will firm and speed things up. There were lots of March Break skiers out which was great to see. One last tip, if you go out skiing today be sure to put on some sunscreen...you'll probably stay out much longer than is good for your skin. Enjoy. We skied on Tuesday night from p7 to Keogan and a bit on the parkway. Generally speaking, conditions were good. My poles were still punching through the surface, making faster skiing a bit challenging on Ridge Road. The parkways were fine. Things should get solid quite quickly with the relatively warm days and cold nights. We skied at Nakkertok this morning. It was in great shape, freshly groomed too. Ready for March break crowds. It was great to see the huge crowds in the park yesterday morning! Hope they all enjoyed the fabulous weather. We've had several reports that skating in the Lac Philippe area isn't great since there's a mystery ridge in the skate lane and it's still a bit soft. Hopefully they get that sorted out. In fact to be great skiing the entire network needed to be groomed again yesterday... let us know if it has been. Report on Lac Philippe (by Loreson)... I did the 53, 51, 50, 52 triangle today. Fortunately, I went classic. 50 had been re-done today: the skating track was almost unusable - higher at one side than the other and so narrow that it would have been impossible to skate without cutting the single classic track. The section of 53 between the intersection with 51 and P19 was about the worst track-setting Iâ€™ve ever seen - the snow had been pushed off the trail rather than being compacted and track-set - it looked more like a skid-road than a ski-trail. The classic section of 55 has still not been tack-set since the snow-storm. The track-setting in the Lac Philippe has been problematic all season in contrast with the rest of the park. Just wanted to report that Fortune Parkway and Ridge Road had been freshly groomed while I was out today. A very pleasant change! We're headed to Nationals and Mont Valin today. No reports until Sunday. But I expect perfect skiing Saturday. Starting this morning at 9 am, the trails were nicely groomed and super fast for skating! It started to snow around 11:00 as we were leaving, so the trails might slow down a bit this afternoon. If you're thinking of heading up towards Champlain, you should stop in at Western and check out the Cookie-Beiner that Chelsea Nordique is putting on - looks like an awesome type of race!! Beautiful Day for a ski and a BBQ! The snow was mainly dry but Conditions were fast with a little slush on the South facing slopes. I didn't test any grip wax, I skated but the Vauhti Aluminum covered with Carrot is my guess of what would handle the variable snow types - dry and slush. Hope everyone had a great ski! The Parkways, Trail #5 and Trail #1 were groomed some time during the day yesterday but not last night as there was a reasonable amount of skier traffic over the grooming. Conditions were hard packed and icy in the classic track, but surprisingly dry and abrasive on the skate track. This will transform quickly to moister (but still hard packed) as the temps rise from minus 12 to zero over the day. Not a real report, just a prediction - don't expect grooming today or good skiing. Looks like lots of rain and temperatures near 0°C until Friday. If it cools down and freezes Friday I expect fast skiing for the weekend, but will assess Friday morning. A beautiful day for a ski. By 8am most of the parkways and Ridge Road were partly groomed and by 11 they had all had a second pass. It was corn snow in the shade and sugar in the sun. Easy edging for skating and what looked like decent classic tracks, at least they are not icy. It's fast but manageable and not scary. There's a cold wind, but for the first full day of Spring its great skiing! Oh, and if you're adventurous try some crust skiing - it was supporting my >200lbs, so you're safe. Good day to go "anywhere" on the crust. Hard to tell if trails had been re-groomed as there were lots of skiers out. But then again I skied from 1:30-3pm, not my usual time but rather sunny and warm! Air -4C, snow still -8C in the shade, but a whole different story in the sun. Welcome to Spring skiing - freeze/thaw and trickier waxing. No, it's not just time to skate. My kick wax, Vauhti Violet Klister frozen then covered with Vauhti Silver Minus Klister, worked perfectly in the wet and dry corn snow and even prevented all those nasty oak leaves from sticking! If I were starting out earlier in the morning I would put the violet on a bit thinner or mix with blue. The secret to this combo is - violet provide the malleable texture to grip the warm, round, wet corn snow and the Silver Minus provides a barrier against the colder, sharper, dry corn snow as well as the dirt and debris while providing more glide. Warning: There are 2 Vauhti Silver klisters - Silver Plus and Silver Minus. Silver Plus is mixed with Red, and is for more consistently wetter snow while the Silver Minus is more a cover layer mixed wet/dry and dirty snow. Play around with klister, when you hit a combo that works you'll really enjoy it. I skied the course for next Sunday's 100km Penguinman, but backwards and classic so I don't ruin the surprise. The trail conditions were generally pretty good. Nothing had been re-groomed for classic except parts of #1. The tracks from P8-P9 were glazed and ice, but except for that I had good grip. That's 50km on that combo from 2 days ago which is good for spring skiing. The skating surface on the parkways were re-groomed, but talking to some skaters they found it wasn't tilled deep enough for their comfort level and they found it too hard and icy in places. Ridge was tilled similarly, but more "skied-in" and sugary so easier edging but there were a few sections were it was hard. Out past #24 looked nice. My 4 days of midday skiing are over and it's back to early morning skiing and posting reports. It sure was chili (-18C at 7am) this morning! That's great news for our snow base. The other good news is that I saw a groomer out at 8:45 coming up from P10 and when I got back to P5 one had gone by there too. Ridge hadn't been regroomed yet and neither hard Burma, both were abrasive but not slow. They were both really hard for the most part and unless you have really stiff skis it will be a bit difficult to edge until ~11am when the sun warms the snow up. Classic tracks weren't regroomed so it's cold klisters in the morning and warmer ones later in the day. Teho green might work early in the morning but I'd put it over klister since it's likely to wear. But still great skiing in the foreseeable future! Grooming does not appear to have taken place today following a snowfall of something like 3 cms. We skied mostly on Ridge and Burma. At 4pm today, the fairly uneven surface was beginning to freeze, making some downhills quite exciting. For the most part, the skiing was reasonable and the weather was excellent! Nice to get back from skiing late in the day and still have sunshine! I skied tonight starting at 6:15. It was just getting crusty as I started and hard when I finished. The skating track was deeply rutted in places and powdery in others. Difficult conditions by the end. The classic tracks were sloppy looking and very icy on the bottom. It will definitely need some re-grooming to be good tomorrow morning. But for an after work ski at sunset it was great. Conditions today are generally fast and firm, and very abrasive for classic skiing. The Parkways appear to have been groomed overnight for skating, but in most places the classic tracks were not re-set, making them a little bumpy. Trail 15 was difficult skiing as it was not groomed overnight and had been skated on, leaving it hard, frozen, and rutted. It should be a very nice day for skiing! Apparently the grooming issues in the Lac Phillipe area are fixed. Excellent skiing conditions, and there is still so much snow, so get out and enjoy some of the best spring skiing ever! It didn't even get slushy today. 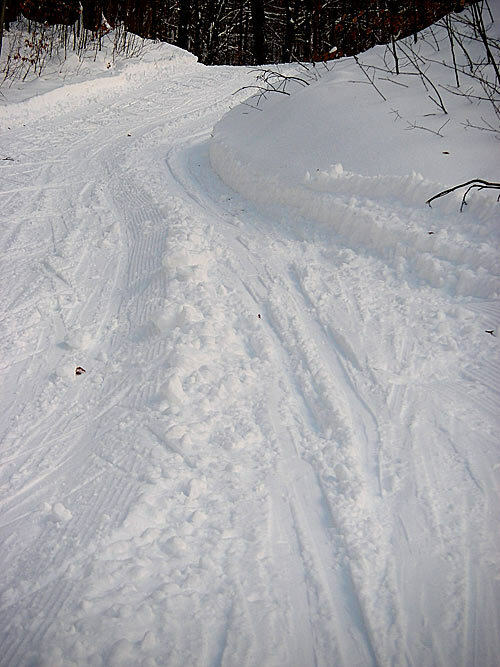 Much of the network has been groomed, and skating was fast, firm, but not too icy. The classic tracks looked good, but abrasive, so would need a klister or teho binder for grip. Amazing skiing again today! Much of the trails have been regroomed and conditions for skating don't get much better than this. Classic tracks look solid and will need a good binder and probably extra if you're out for awhile, to accommodate the warming conditions. A lot of skiers are out enjoying the great conditions and bright warm sun. Starting Point: P3, Glide Wax: N/A, Grip Wax: Swix Red, Trails Skied: Gatineau Parkway #5 & #29. 2-3cm of new snow at Gamlin. rain did not start until a little after 10am. Skate skiing looked slow. Classic skiing required some trail blazing. good skiing! Lot of good April skiing to be had. Rain, what a great April Fool's day joke. More a tease for cyclist who want to ride in the park really. Hope you weren't fooled into believing that the ski season is over. Far from it, there's a 2 foot base and the skiing this morning was great both on and off piste. I didn't go very far, no not because my legs haven't recovered from Penguinman but because the crust skiing was so good. At 7:30 three groomers were just headed past P10. I caught up with them on the Fortune climb. They were turning the hard crusty parkway into a nice sugary surface for skating. Classic tracks were also being regroomed, and were looking pretty good. Once I past the groomers I was faced with great crust skiing on the trails, so why stay on the trails? I headed onto the crust covering the swamps and forest around Fortune lake. It was perfect crust everywhere and lots of great rollers and terrain to explore. I headed back down Fortune and explored the other swamp on the way up the hill. Give it a try. Reports are that Burma and Ridge were groomed by 11am. Enjoy. Grooming did not take place in the P10/Fortune/Champlain vicinity, and I saw no evidence of grooming happening this morning. This means that the skate lanes are: 1. Icy 2. Rutted 3. Bumpy. The downhills on Ridge Road are frequently treacherous. The classic tracks looked better by comparison, so my recommendation would be to classic ski on the parkways unless you can wait until it softens up. While I didn't ski in the direction of Black lake, it looked like it had been even longer since it had been groomed in that direction, giving it an almost unskiable appearance near the Fortune Parkway/Champlain Parkway junction. So the early bird does not get the worm, just the crusty leftovers. If you read the previous report it appears Karl skied too early this morning! I started at 7 from P1, and it was exactly as Karl described until we got to the Champlain Pkwy intersection where we found evidence of grooming on #7, then on the Gatineau Pkwy itself and eventually on #15 and Ridge. I imagine that the entire network will be groomed by noon. That's pretty late as it was already softening by 9 and the evidence at Gamelin suggests they groomed that section too late yesterday. But it's going to get really warm today, and possibly into the weekend so conditions will change fast. Check back for updates. Oh, and cyclists there's still no guard rails showing on the Gatineau parkway. I expect you will have to wait until the 2nd week of May to ride the loop. Word from Demsis is that the entire trail network will be ready by 8am Saturday morning, unlike the last few days were they've been starting at 7-7:30 and finishing closer to noon. While they've been slow getting out the work they've done has been decent. Conditions should be good as there's plenty of snow left to work with. Enjoy! I was a little worried that while I was out of town for the weekend all the snow would have melted. But it doesn't look like the park lost very much. The skiing this morning was great! It was quite slow mid-morning, but 2mm rills or structure would help that. You still don't need rock skis anywhere in the park. It was freshly groomed this morning, and they are grooming this week (apparently for Wed, Fri, Sat and Sun mornings) so get out and enjoy. Lots of cars at P8 and P10 this morning. No grooming at 7:45 when I started. It was frozen a rutted. Tough skating, but decent classic - I choose right today. I skied up #15 and it was great, still lots of snow no bare spots and relatively clean snow. Your poles might punch through a few places. The difficult part was 8:15-8:45 as the snow transformed quickly from crust to slush and it was hard to predict what you were going to ski over next. By 9am it was consistently softer even in the shade, so it should be great by now. Enjoy another great spring ski day! Well, skiing is still possible from Gamelin, just. There is at least 6-12inches of snow but it starting to get washed out from the parking lot to the Bridge over Saint Raymond. Some pavement showing on the bridge. Good skiing from the bridge on. ~ 12 inch base. Trail 29 coming from Relais plein air is flooded Just before the Junction to head to Trail 15. I recommend heading over trail 26. Best bet though is to head higher for better skiing, though it is still possible from the base of the park. Perfect skiing this morning. Grooming was done last night so it was hard and fast. Still lots of snow, even on the bridge between Gamelin and Asticou. Parkway grooming was done early this morning. I didn't go far but P8-P9 was fully groomed and very nice (classic included). P8 to Penguin was gone over for skating, not as well as P8-P9 but it got rid of the ruts etc. The classic tracks had not been redone. I didn't get a chance to check out Ridge Road. Should be nice skiing today. Only a few more days with grooming left! Get out and enjoy it. What amazing mid-April conditions - lots of snow and good grooming. Not a bare spot to be found anywhere and you still don't need rock skis! I skied from P10 to the Firetower, back on Burma, and it doesn't look like there was any snow lost yesterday at all. I highly recommend that route today. It's a bit late for a report, but I just kept skiing and skiing. If you head out right now, I suggest classic as skiing was getting slow and the snow was turning to whipped potato consistency. Classic was still firm and the the tracks were fast. A spectacular morning including bright sunshine and fast skating conditions. Ridge Road and the parkways were in the process of being groomed (for the last time, unfortunately) while we were skiing. It did not appear that the tracks were being re-set, so I might opt to skate. At the same time, things will soften up quickly and the classic skiing should be good too. I think we can still squeeze a couple more days out of the season! The classic skiing was actually very nice this morning, with the tracks remaining pretty firm at mid morning. Ridge Road and the parkways all have lots of snow. There is certainly more skiing to be done! By 14:30 the conditions were very soft everywhere. There was also a considerable amount of suction and the classic tracks were disapearing quickly. With a foot of base higher up, there is still plenty of skiing even with good skis on most trails. Skiing tomorrow morning if it freezes is not a good idea as Demsis is done grooming for the season. Icy and fast this morning, overall quite good skiing. Skied from Gamelin to Huron. From Gamelin to Asticou will probably be unskiable at some point today (I only has to take my skis off on the bridge this morning). A few small bare spots from Asticou to Huron. The bottom on Pink Lake, and right beside Black Lake were quite thin, and could become bare today. I started at 7:45 and it was a bit crusty, but not as rutted as I had expected. The extreme warm really wears the ruts away I guess. At 8:15 the crust softened and it was perfect along Ridge to Penguin and back. The river crossing at Shilly Shally that Justin photographed yesterday was a bit trickier this morning..soakers! But a beautiful ski down Burma made up for it. If you stick to the parkways good skis are fine, in the bush it's getting a bit dirty and there are lots of twigs but you can get away from it. Weeks of (rock) skiing remain. Trail 1 and 24 from 1B junction to McKinstry has full coverage except for a small section at the lookout bench. Snow depth on the bridges is 50 cm. Skating lane was solid and classic tracks fading, the north side more than the south. One washout and one scraped bare lump on 40. Lots of good skiing to come out there. Starting Point: P1, Glide Wax: N/A, Grip Wax: N/A, Trails Skied: GP to Mulvihill Lake, return via 7, 15, 5. From Asticou, a bare spot just before you get to the parkway, then the next walking was crossing Notch Rd on 15, then at the hairpin turn on 5. Several expanding bare patches and black ice patches on GP, but fast and not too icy. 7 and 15 were solid where the classic tracks had been, but were very soft in the skate 'semi-lane' between. With softness and many near washouts on 15, so can't recommend for skating anymore. Skied from P12 to McKinstry this morning and conditions were great! There were maybe 4 short sections that were bare. It is getting to be time for the rock skis now. Saw about 20 people heading out as I was on my way back, so great to see lots of people taking avantage of the t-shirt ski weather we're having. Reports are that skiing from P10 is still good, and even coming up Burma is quite skiable with a few bare spots. Enjoy! The skiing over the last few days has been surprisingly good, not to mention special. With the temperatures we have been having, it's been fun to experience what skiing would be like as a summer sport. Imagine margaritas and bikinis on the porch of the daylodge, for example. Today we started at P16. We had to take our skis off about 3 times, not including the walk up the first hill. We were skating, and the conditions were surprisingly fast and firm. The end is near, not question about that, but we might eke out a few more days somehow. I would say that between Sunday and Monday we crossed a certain threshold, that being between the last of the "real" skiing and the beginning of the "novelty skiing". In other words, if you still really want to ski, it is possible, but you will now have to put up with walking in order to get some skiing. On Monday evening it was still skiable from P10 to Fortune Lake. There are two stretches of walking between the lake and Gossip Corner. The snow runs out again near the T. While we didn't have time to ski much of Ridge Road, it looked pretty good, maybe better than the parkways, in the direction of Penguin. On Tuesday we made another attempt at skiing from P12. While most people would not have considered it worthwhile, there was some patchy skiing available between P12 and Ridge Road. There looked to be some reasonable stretches of skiing along Ridge near the 24 junction, which is sometimes referred to as the "Gatineau Glacier" as it is a good place to look for snow when all else fails! Starting Point: P12, Glide Wax: , Grip Wax: Waxless, Trails Skied: Trails 40, 24, 1 to Wolf Trail bench. There might be very, very, very short patches of skiable snow in the park but I think the season is over. The Fortune parkway is mostly clear for cycling, so time to switch gears.